About 150 volunteers, athletes, sailors and residents have their work cut out trying to clean up this stretch of beach at the end of Tub Canal in Sattahip. 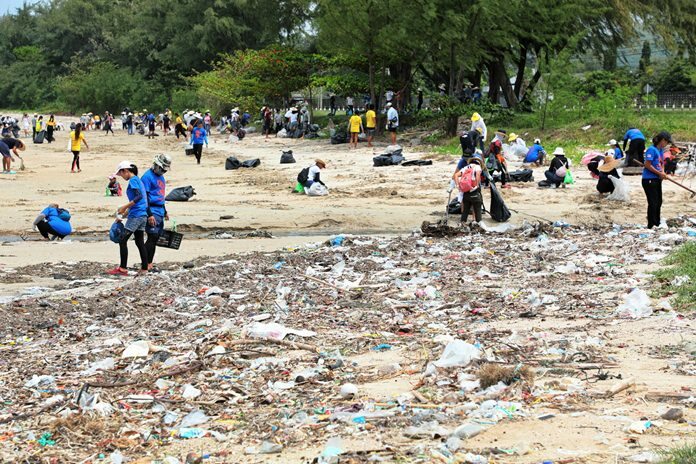 About 150 volunteers, athletes, sailors and residents collected garbage spoiling the scenery around a Dongtan Beach canal in Sattahip. Volunteer group Mahasamut Patrol Thailand organized the Sept. 8 cleanup at the Tub Canal, which has suffered chronic pollution problems due to garbage being dumped into the canal and washed into it by storms. Organizers Tippawan Kanwaset, 42, said the volunteers came together out of a sense of community spirit with no interest in being paid for their service.